In April 2012, Aesthetec partnered with TIFF Kids International Film Festival to create Toronto’s very first TIFF Kids digiPlaySpace—a digital playground for kids promoting creativity and self-directed learning—at the prestigious TIFF Bell LightBox in downtown Toronto. digiPlaySpace was open during the TIFF Kids Film Festival from April 10-22, and was attended by more than 5,600 people in its 12 day run. The space featured interactive installations for kids built by artists, a giant green screen studio, a stop-motion animation workshop run by filmmakers, as well as a Maker Zone—where kids could learn about new tools such as 3D printing, DIY electronics and robot making. 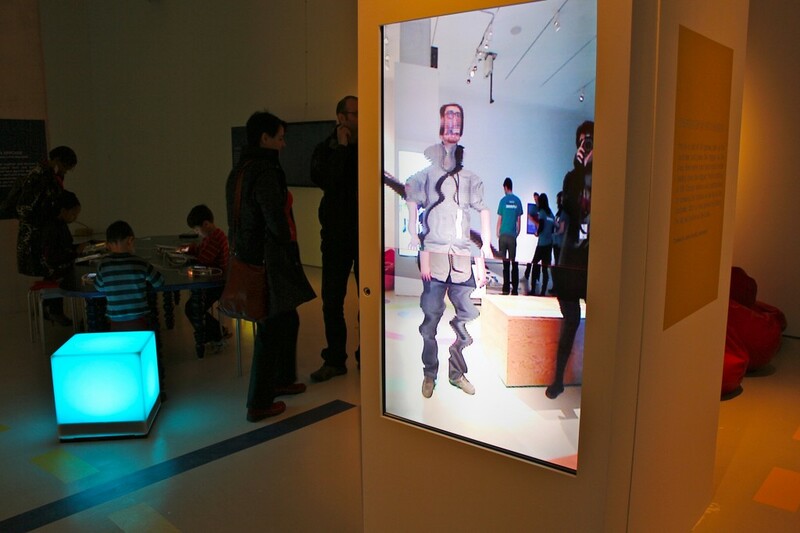 A digital version of a fun-house mirror, the Magic Mirror is a screen that distorts live images of the audience. Using real-time manipulation of the video feed to mimic the slit-scan photography technique, the audience sees their own image twist and turn on screen as they move in front of it. 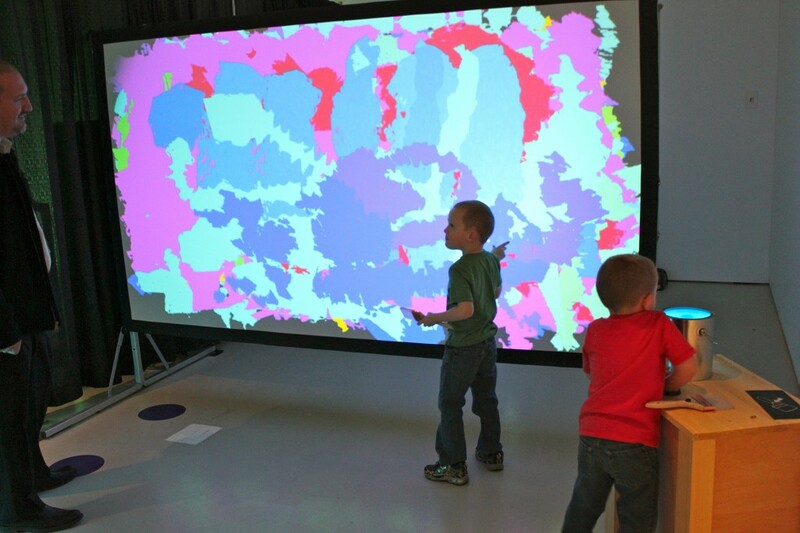 Two 60″ screens were installed in the digiPlaySpace. Sing & Paint is an interactive installation which the audience can explore the colour and texture of their own voice. The audience is invited to record a short sample of singing (or speaking) into a special paint can, pick up a light brush, and paint on a digital canvas. As they move the brush, their voice is transformed into colour and sound. The colour selection is based on one’s pitch, and the speed of the playback is controlled through the brush movement. Light Loops is a set of touch-sensitive light drums that lets audience jam together. This latest iteration of our touch-based musical instruments takes inspiration from the Caribbean steel drums, where multiple notes are created from different parts of the surface. 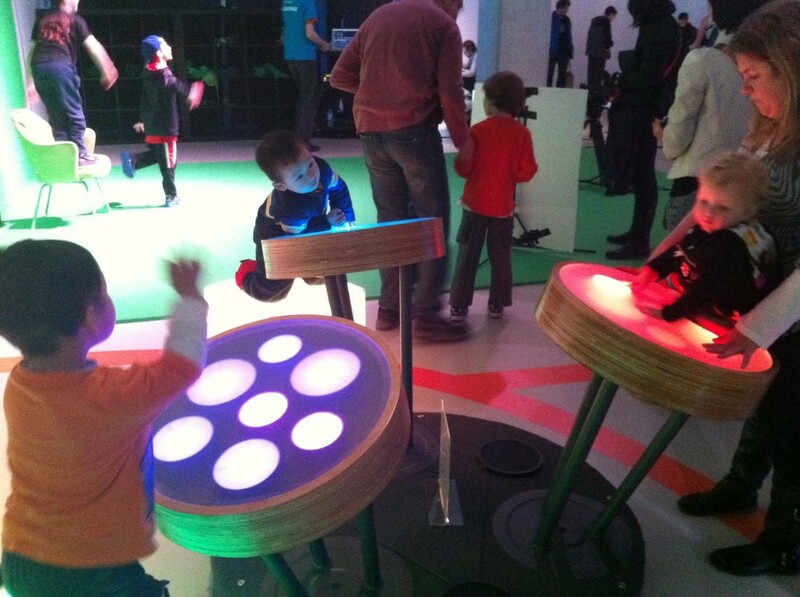 The Light Loops drums are designed specifically for kids, but are tall enough for adults to play along.